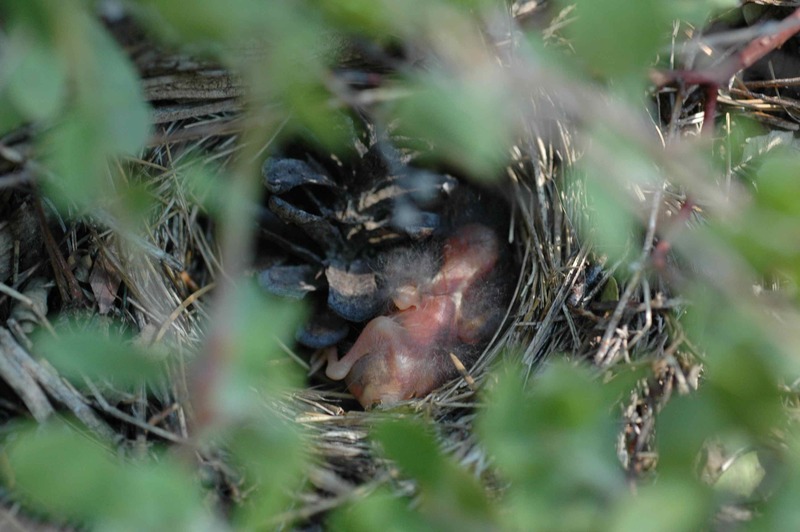 This summer we have lost nests to logging, cows, and natural junco predators. None of those shocked me. A pinecone as death-dealer, however, was a surprise. When I took this picture, I thought that this nest was dead. The chick you see was completely motionless and stone cold. 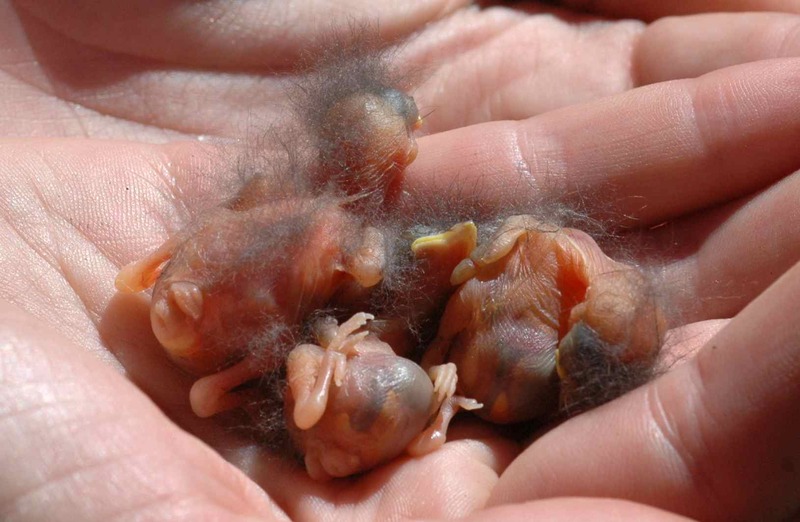 The pinecone—which was not supposed to be in the nest—had (we think) prevented the female from warming her chicks up, and without their mother’s warmth these very young, naked chicks quickly got too cold. But when I took the pinecone out to count chick bodies, one of the bodies moved. My field assistant and I took the chicks—there were three, all as cold as the morning mountaintop air—in our warm hands. I still thought they were probably dead: recently dead things may twitch when disturbed. But as the tiny bodies began to feel less chilly, they squirmed more and more. The biggest one gaped and tried to sit up. Its little siblings were too young to attempt that, but were clearly also alive. When they were as fully warmed as we could manage (human body temperature is lower than that of birds), we put them back in the nest—minus the pinecone!—and retreated. The female had been angrily chipping at us as we revived her chicks, so we knew she had not yet abandoned the nest. 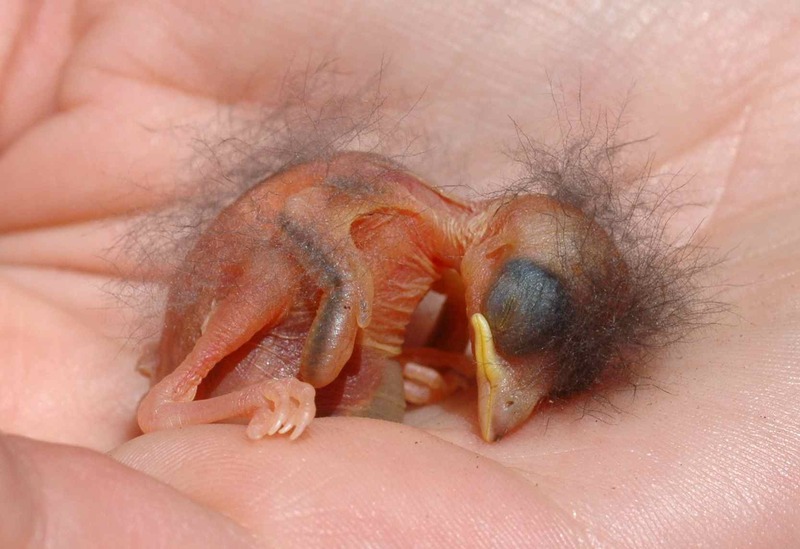 I had heard that very young chicks may be able to survive periods of cold, but had never seen it firsthand. It was truly a unique experience. I have encountered a lot of motionless, cold animals, and never before had one come back to life in my hand. When we most recently checked the nest, all three chicks had grown and there was no sign of their brush with pinecone death. 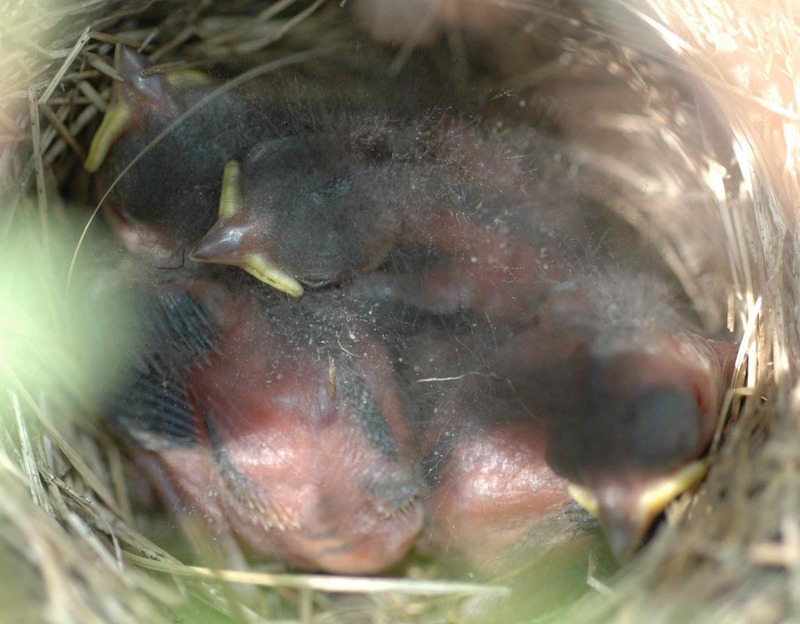 This entry was posted in DEJU, field work, notable juncos and tagged biology, birds, Dark-eyed Junco, field work, nest, nestling by toughlittlebirds. Bookmark the permalink. That was a wonderful way to start the day…thank you. What a wonderful, heart-warming story! And what a wonderful experience that must have been for you! That is one dangerous looking pinecone! Your timing must have been excellent. Did you breathe on them to help warm them? A friend told me that breathing on things to warm them can be bad because the humidity in your breath can condense on the object, then cool it by evaporating. I’ll admit I haven’t investigated this yet, but I have provisionally stopped breathing on things to warm them, in case it is true. Fascinating story. It’s interesting how it’s still possible to learn. What an unusual story with such a great ending! Wonderful story. I am glad that they were not rejected by the mother and that they are healthy. I was surprised that the mother was still around too, but it seems like juncos give dead-seeming babies the benefit of the doubt for a while. We’ve been scolded for approaching nests with babies that have clearly been dead for at least several hours. Most of the time it’s just sad to see – as if the parents can’t “move on” – but in this case, it was great. How is your study area? Was it in the Rim fire area? If the mom comes back to the nest, the chick will warm up and should be okay (assuming the nest doesn’t fall again). I hope she comes back! Interesting! Sciuridaes will abandon their infants after finding them cold. If you find a cold baby squirrel on the ground, keep it warn with a water bottle. Only then will Mom carry it back to her nest.